Debuting in the Silver Age of Comic Books, Thor first appeared in Journey into Mystery #83 (August 1962). He has starred in several ongoing series and limited series, and is a founding member of the superhero team the Avengers, appearing in each volume of that series. 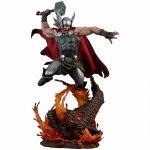 Check out our great range of THOR Licensed products below. All available to order via your local stockist. Thor Statue - God of Thunder Every inch of this classic Thor portrait has been crafted with l..
Thor - Breaker of Brimstone - Premium Format Figure Sideshow is proud to present the Thor: Br..
Hulk – Thor: Ragnarok Q-Fig Max Diorama An armoured Hulk springs into action, ready to land..
Loki – Thor: Ragnarok Q-Fig Diorama The wily Loki whips out twin daggers as he teams up wit..
Thor – Thor: Ragnarok Q-Fig Diorama Thor kicks up a fierce dust cloud as he charges forward..
1:10 Valkyrie - Thor:Ragnarok - BDS Art Scale Statue Valkyrie will be fighting alongside Thor..